Last weekend I picked up a used Akai S2000 Sampler for $20 bucks and thought I’d have some fun with it. I’ve actually never owned an Akai Sampler before and I understand the S2000 is likely to be last on everyone’s list of samplers to buy, but I thought I’d give it a shot. Below are some thoughts about the Akai S2000 based on my experience over the past few days working with it. I have been successful at attaching an Iomega 100MB Zip Drive and a Fujitsu 230MB MO drive to the Akai S2000 without any problems. I can format, load, and save samples, programs, etc. to these drives. I have not been able to successfully create a boot disk with the a zip or MO disk yet and still must rely on the Floppy Drive to boot up OS Version 2. This is not a problem, but it would have been nice to be able to boot up with an MO disk like I can with my Roland S-760. I haven’t had any success getting any SCSI external CD-Rom Drive to work with the Akai S2000 yet. I have 4 different CD-Rom drives of various ages and none of them seem to work. However, it is possible the CD-Roms drives do work, BUT, the Akai Disks are not readable. I have been burning Akai S2000 CD-Roms with Nero and none of them work with the Akai S2000 even though they work with ESC ( Extreme Sampler Converter ) software on my Windows 7 computer. So the Akai S2000 does see and attempt to access the Nero burned Akai CD-Rom, BUT it always displays an AKAI SCSI Disk not found error. So my thinking is that Nero or something messes up the CD-Rom Copies after burning. I am not sure. ( Note that I am well aware of changing the HD SCSI under Global to access the various external drives ). The only way I have found to effectively and quickly import WAV files into the Akai S2000 is with a program called Akaidisk. This program works really well and I found it to be quite fast. You are limited to importing 1.44MB worth of samples at a time, but that is fine for me as I primarily work with muli-samples rather than loop based phrase samples. I run Akaidisk off a Windows 98 computer that I have for working with older samplers and synthesizers. Akaidisk works perfectly and it’s currently my preferred choice of getting sounds into the Akai S2000. In fact it’s the only way that works for me at the moment. So far, I have been unable to get any software editor to work with the Akai S2000 on Windows 98. I do not have a Mac and my other computers are using Windows 7. Akai Mesa for PC and Chicken Systems Millennium which I’ve heard great things about do not work at all on my Windows 98 computer. Mesa actually “sees” my S2000 Sampler, but I then get “Time Out” messages whenever I try to do anything. Millennium just crashes whenever I open the program. Toss! I am aware that it may be easy to fry or pop the SCSI related fuse in the Akai S2000, but since my Zip and MO drives work via SCSI I feel that is not the case. Akai Mesa PC on Win98 does see my Akai S2000 but whenever I try to access it by creating a Program for example, I get the “Time Out” error. Why the Akai S2000 is timing out every time, I am not sure. I have tried all sorts of SCSI Drive and cable combinations with zero luck. My computer will simply not work with the Akai S2000. A few other Akai S2000 points. 1. I do not find working with the Akai S2000 menus to be all that difficult at all. Many people say it’s a pain or very slow, but when I want a particular set of samples mapped on the keyboard within the S2000, it’s pretty fast. I find goofing around with the technical problems I mentioned previously to be more time consuming. Heck, working with my Roland Fantom XR Sampler Rack isn’t all that faster especially when using the software. The key is to find a workflow and make it happen. For now, Akaidisk and Win98 with either a zip or MO drive connected to the Akai S2000 works fantastic. I do wish I could find a working CD-Rom drive that works, but perhaps later I’ll find one. ( Or like I mentioned a way to properly burn Akai Disks ). 2. On a positive note, the Akai S2000 has a lot of great functionality. It sounds great and it’s actually very easy to program. For $20 bucks, I think it’s a bargain! 3. It’s likely I can get the HxC SD Card Floppy Drive Emulator to work with the Akai S2000 no problem. I have two HxC SD card Emulators and will have to try this. Akai S2000 floppy disk images can be created with OmniFlop for the HxC Emulator. The Akai S2000 should be able to boot from the HxC and access any disk images placed on an SD card. First one would create a Floppy Disk with files using Akaidisk and then use OmniFlop to create an Akai Floppy Image. Drag and Drop these files onto the HxC and load them up into the Akai S2000. I’ll have to test this but I’m sure it will work well. 4. I haven’t tried using the Akai S2000 with any external hard disks yet but I’m sure it will work since I have a Zip and MO Drive working. I’d rather stick with removable media however as it’s more reliable then having a Hard Disk break down on me. I also find older Hard Disks more noisy. See update below. Stay tuned for more updates on my adventures with the old but familiar Akai S2000. UPDATE – Importing Akai CD Rom Programs and Wav files into the Akai S2000 Sampler. Today I was able to successfully import Programs from Akai CD-Roms using Translator, BUT, only running on Windows 98 Second Edition. I’m finding more and more that Windows 7 is not good at all for working with old synths and samplers. I have found that pretty much Windows 98 works with most tasks that I need to accomplish. I was able to use an Iomega 100 or 250 External Zip drive for reading and writing the Akai S2000 programs/samples. I was also able to use MO drives of 230MB or 640MB in size as well. Fantastic!! I can now virtually convert and import anything into the Akai S2000 Sampler this way. Now on my Windows 98 computer I can see anything on Akai formatted CD-Roms, MO Disks, Zip Disks, and Floppies. Brilliant! I also found like with the Ensoniq EPS Classic that you need quality cables and a good solid Mixer to get the best sound out of the Akai S2000. If you don’t, you are likely to get unwanted static or noise. Hi Jim, great article, two thumps up for it. I also new to the S2000, got mine yesterday. You helped me very much with some detail questions. Appendix 4 of the english manual from the Akai website suggests that you can boot up from HD, when you use SCSI ID5 and put the OS into the first section of the disk. I’d think this should work with at least the zip drive on which you can switch the id to 5. But I’d guess you already tried this. On my MPC 2000Xl I had to switch “Load from ….” in some menu to let the new default point to ZIP/HD to automatically load programs and sounds, which had not been clearly stated in the manual. I more or less stumbled upon it while browsing through the menus. Now I’m out to check if and how a internal HD can be applied, I did this to the MPC beside of a internal Zip an its a bliss. The HD is very quiet for its age and compared to my three PC’s standing beneath the desk. And I saw a S2000 outfitted with a internal HD on ebay, it is possible even if the most postings in the net seem to speak against it. Hello Swen! Thanks for checking out my blog and congrats on finding an Akai S2000. Recently I was able to successfully boot from a zip disk so I finally was able to get that working. I’m not sure if I did anything special, but I only had to make sure that the Zip Drive was on SCSI ID5. The Zip drive also had to be on with a Zip disk inside. The OS was saved to Partition A or the first Partition. Works great! As mentioned I currently have no issues with zip and MO disk drives now. My only problem is that I haven’t successfully found a CD-Rom Drive yet that will work. I came close with an old Yamaha CD-RW drive but the S2000 would only read samples from Partition A. If I switched to any other Partition, the Yamaha CD-Rom drive would freeze. It’s not critical to have a CD-Rom Drive but it’s the challenge of finding one that probably bugs me the most … laugh. I’ll be curious how an HD works with your S2000. I have one here that works but it’s a tiny bit loud at the moment. Reading through your blog was a delight. I’ve installed Mesa II two days ago on a system running Win Xp, using the Win98 compatibility mode. There is a Adaptec SCSI-Card in the pc which I would have had to move to my Win98-Legacy system so I just tried on Win XP and it works. Tomorow I will try the HD, and I will let you know if and how this works. I it won’t I will have to grab a Flashrom or something alike. Or at least a internal Zip, cause I wan’t the S2000 to be used in Live situations instead of a PC and various Synths. And I wouldn’t like having to carry loads of SCSI equipment to a gig. Besides, you know that we’re fools loving that old equipment? I got an (also aged) Creative Audigy PCI audiointerface which can use up to 96MB Sample-RAM for loading Soundfonts. It’s features are very similar to the S2000, 2 LFO, 2 ENV’s and a Filter, Delay/Chorus/Phaser/Reverb. Creative also supplies a software capable of creating your own SFZ’s. Main difference is that you can use samples up to 96/24. Wow! Today I struck gold and finally acquired a CD-Rom drive that is 100% compatible with the Akai S2000. The CD-Rom drive I found is a Panasonic LF-1700JB which was located in a used mom & pop computer store in Nagano-city, Japan. It’s really cool because it also has a headphone jack and volume if you want to listen to audio tracks as well. Note it cannot do this for Akai Sample CDs, but it definitely loads them into the Akai S2000 without any trouble at all. It’s fantastic!!! It also cost me only $8 bucks and it’s in great condition with box, manual, disks, cables, etc. 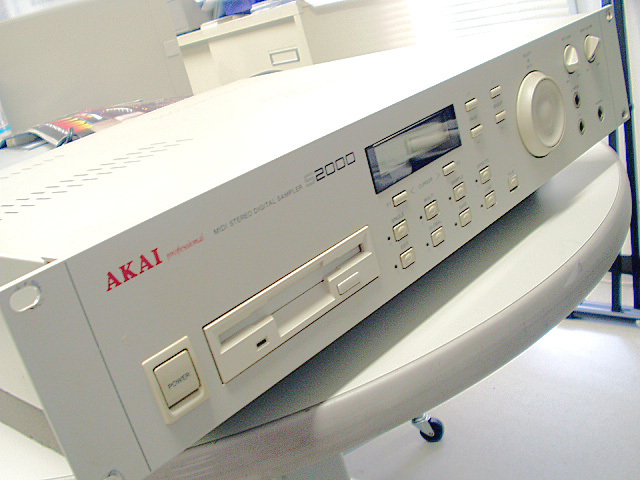 I found it really hard to find a suitable CD-Rom drive that would completely work with the Akai S2000. Now I can finally enjoy checking out better the Akai library I’ve accumulated over the years. Update: I just loaded up an EMU Vintage CD Rom and it worked perfectly. Awesome! I can now load up likely most of my EMU collection as well. It’s going to be a long and fun weekend hopefully! The Panasonic LF-1700 CD-Rom Drive works so well with the Akai S2000 Sampler that I found and bought a second one from Yahoo Japan Auctions for $5 bucks! This one has the optional cartridge which is pretty cool. It works great! The Panasonic LF-1700 is definitely an awesome CD-Rom drive for the Akai S2000 Sampler. A little addition of interest. I found a library of real cool free samples on adventurekid.se. This wouldn’t be so interesting if the library wouldn’t have been so complete. Get it and you got all the stuff you need. It’s really a complete sound designers “out-of-sorrow” pack. I love it. Besides since Mesa II works well for me I decided (for the moment) not to put a HD into the S2000, but packed one into my System running Mesa. This work pretty cool, the sampler recognizes the disk and I can work on the samples with a normal audio editor (Wavelab 7 Le). Thats fine for me for the moment, I’m all into sounddesign right now. Thanks for the great link. Nice find! I think this is what you were referring to. All in one pack! Wave format (suitable for many synthesizers and samplers). having problems with loading samples in to s2000 from zip.it loads os ok but comes up error during the load up of samples?should the transfer of info be smooth as im having a lot of heavy clicking but sure drive is ok and not the clic of death.thanks for a great page jim. finaly solved the problem.found a panasonic lf1500.do you think this would work with s2000? Which software should I use so I can read in my PC my Akai S2000 zip discs? Where can I download it? Chicken Translator will work reading your zip discs on a PC. Do you know if CDExtract works? It didn’t work on vista. Hello dude. Really informative blog you got here! I got an Akai S2000 and have been trying to get it running for a little while. I tried sampling into it direct but it froze! 😦 Just wondered what you advise on how to get samples loaded up on it without too much hassle? Incidentally I’ve tried loading up cds on it too but no love? I’m running Windows 7 by the way. I’m gonna be getting a usb disk drive soon so plan on giving Akai Disk a good thru that route. Look fwd to your response. Nice one! Hello Aaron! Thanks for the comment and sorry for the late reply. The only way I can effectively and consistently get samples into my S2000 is using Windows 98 with Translator and Extreme Sample Converter. I use these to convert samples and WAVs to AKAI format and then copy to either MO, Zip, or CDs. I also use a Panasonic LF-1700 CD-Rom Drive which works perfectly with the S2000. Other than that it’s pretty much testing different devices to see what works with the S2000. I haven’t had any luck really using Windows 7 for anything with the S2000. I’ve pretty much given up on Win7 and have just stuck with my trusty old Win98 which works wonders for old sample hardware. WinXP likely would work well too. It took a lot of experimentation to get my workflow straight with the S2000 and now I can import just about any sample set out there. Sample corruption may occur while transferring the samples from the PC to the sampler, within the samplers RAM, or in the process of chopping it on the PC. There is also the possibility that the sound-programs on the sampler get weird parameters if you transfer the samples using Mesa II, which may lead to strange sounds and even no sound at all. So what SCSI-Interface are you using, on which Operating System are you working and what software are you using to chop the samples and transfer them to your sampler? Do the samples also sound strange if you save them back to the PC? And just in case your samplers RAM may be defect, if you load more than one sample are the secondary and third ones (the first which ranges beyond one second if you add their runtimes) also effected like if it is one long sample? Questions over Questions as we germans say, so if you like to talk german to make things easier, you can reach me at Swen_is_terror@yahoo.com, and I will try to help you fix your problem. I have an interesting problem with my Akai S2000 and I’m not sure what exactly might be causing it. I have converted some basic Roland S-50 patches into Akai format using Translator on Win98. This was easy to do and I didn’t experience any problems. I then inserted my MO disk into the Akai S2000 and loaded the program. The samples and everything loaded just fine, however, there was one small problem. In each keygroup there were two keys ( always B and C ) that had the same pitch which shouldn’t be the case. F#1 Sample in keygroup 1 ranges from A0-A#1, BUT B0 and C0 have the same pitch. C2 Sample in keygroup 2 ranges from B1-D#2, BUT B2 and C2 have the same pitch. How can this happen? Any ideas? Now, I can understand if two keygroups next to each other might have the same pitch like A#1 and B1 in which case I would simply tune one of the samples. However, in the case above, the pitch is the same across two notes “within” the keygroup. Very strange. My question is this: Has anyone experienced this issue? What parameter might I need to investigate to adjust this? So far my keygoups, zones, tracking, and tuning all seem to check out fine. Perhaps it is possible to “individually tune” each key within a keygroup range. If so I could possible just tune one note and not the range. I’ve been at it all morning going through the sample and program edit parameters and can’t seem to figure out how a sample within one keygroup can have two notes of the same pitch. I successfully was able to connect my little G4 iBook to my Akai S2000 using a USB/SCSI cable. Everything works perfectly except for one major problem. Mesa for Mac only imports programs with the .sp extension. Windows and even programs like CDxtract and Translator only convert programs into .s3p format. Thus there appears to be no way to import .s3p files. Is this true? If so, then Mac Mesa is completely worthless. Why on earth did Mesa not just use .s3p I wonder. Now it looks like I’ll have to move everything over to Windows again so that I can convert and import .s3p files. Any former Akai Mesa users out there on the Mac know about this problem? I thought it would be great to convert sound files into MESA format using CDXtract, but I just can’t believe they won’t import into MESA for Mac but rather Windows only. All of these proprietary formats just drive me nuts…laugh. Akai Mesa for Windows imports/exports programs in .S3P format. Akai Mesa for MAC imports/exports programs in .SP format. After a year of hard work to get anything running, I have to admit that I now know why most people think it was one of the worst samplers ever, it is simply a truth. I run MESA II from a Win98 System, mainly because its available for free, And it is working, with some restriction like I can’t get onto the other SCSI Devices from Mesa. This means I have to save everything from the hardware, but that is a smaller drawback. The major bug I just can’t get around is that MESA randomizes every program within the sampler beyond the first one. So I always have to rename the “Test”-program instead of creating new ones, anything else freaks up the parameters to FUBAR. If I want to work with more than one program it means I have to keep the PC off, load anything from the external harddisk and edit the keygroups, splits and layering on the display, which I learned to hate. The harddisk was a problem by itself, I had to format it to Akai-Format from my MPC2000XL to get the S2000 to read from it, and i never got the Zip running, which works perfectly with the MPC. Compared to the MPC handling the S2000 is nothing less than a catastrophe, and I’m looking for a S5000/S6000 or one of the top-of the line EMU’s to get my hardware-sampler desire satisfied a little less time consuming. I like the S2000 for its sound, but I think a S3000 or S2800, would have given me the same vintage Akai sound plus a bigger display, more ore less for the same price. But still I learned to love hardware sampling on the two Akai’s I own, and now that it is running like it does, I will keep my S2000, even if I only use it for basic sampling purposes cause everything beyond that is just too time consuming. And that is a shame, cause my S2000 has the FX-Board and 8 single outs and Max RAM. Just like my MPC, which I bought at a only slightly higher price at the same time, but it was a much bigger bang for the buck. Consideration of it all is: I would not advise anybody to buy a S2000 after I know it by now, because it is a tricky beast that bugs around like an old mule. But since I paid less than 100€ for it still was a good deal. It did cost me around 70€ to get SCSI-Hardware which was halfway compatible, and now I got lots of SCSI-spare-parts who are not. Much more it did cost time and nerves, and here comes the crux, It never worked 100% the way I wanted, very much unlike my MPC, where I get things done in a breeze. I couldn’t get a CD-Rom running on the S2000 and that is the last big FY, it has given me, because if you consider all the facts about it, the S2000 would be a good sample-player for the Akai-Library disks, but it just doesn’t work with two CDROMS i bought, both should have been compatible, both run on my MPC. So, unluckily, this piece of hardware never became the workhorse it was intended for in my studio. So if you’ve got a little bit of the lust for fiddling around on old hardware until it runs, like Jim and me, the S2000 may be the right piece of hardware for you. If you want or need a sampler which just runs out of the box, is compatible to the Max and has some “Ease of Use”, forget about it (if you’re not getting a full system, with harddisk, CD-ROM and a computer at best, with ready made library, all installed and ready to go!!!). And definitely forget about it if you’re a newbie to hardwaresampling, and not used to older pc components and crafting a PC from scrap. First thing to do when I got my S2000 was reinstalling the RAM’s cause they got loose on the delivery. First of all I have to thanx these great information interconnecting S2000 with various scsi components and with pc/mac. I bought secondhand an S2000 for 50 Euro which is come with a compaq external enclosure with an apple cd (I’ll identify it later). I ve got 7 pcs. old 9.1 uw scsi drives and aleady set the id to 5 (2 of them for testing). Is it truth that Akai S2000 sees only one device (with id 5) at a time ? I ve got an old Gateway desktop (PII) running xp sp3 pro at this time, but I have to get a cable beetwen the S2000 (DB25) and the adaptec 2940uw (inside the gateway). The external enclosure has an old centronics cable (scsi1?) with the other end DB25 – to S2000. So at this time I am trying to daisy chain all of my peripherals to work with the S2000. I’ll will inform You with the config and maybe it will be usefull info for other visitors as well. Hi, I recently got the AKAI s2000 up and running. Samplerzone.com sent me a parallel cable instead of a scsi cable, but I went to a local electronics store and found a db25 to male centronics scsi cable and a centronics female to db25 male adapter (not sure if it was scsi or parallel) and it works! I thought samplerzone specialized in samplers – drove me crazy that they sent me an adaptec pcANYWHERE cord. Anyways – mesa is driving me nuts, but I’m a registered Recycle 2.1.2 owner, and I contacted propellerheads and they are sending me a replacement recycle 2.0 cd for $17. So I will have good workflow on my powerbook g3 once I get that. I think that is the only way to be happy with this sampler on a mac. i look forward to receiving it next week. hope that helps Jim. I bought the s2000 because I couldn’t afford an MPC at the moment, and I have a love hate relationship, but recycle will automatically lay out the samples across the keyboard, saving a lot of time. i just stumbled across this blog as i am about to get an s2000 for 50€. your info is a a huge help – please keep it up. i´m on a mac and probably all of the scsi hoopla wont work. i am planning on sampling directly into s2000 and using it for one shots. hope that´s viable. Hello! Sampling direct to the Akai S2000 works great. I do that primarily with my Roland S-series samplers these days because I know the unit so well, it’s just easier. Note that I have successfully used a logitech usb to scsi cable with my Mac G4 without any issues along with Akai MESA. That setup is very similar if not the same as what I do know with Windows. I use Windows because I don’t have to cross platforms much with other software I use. Best of luck! thanks for a quick reply and sorry for not writing back right away. my mac mini got its ram sockets fried. i got the s2000 and realised the samples dont get saved into ram. its obvious ofcourse – just hadnt thought about it. looking for a external hd to connect to scsi. probably my best bet. do you know what the maximum partition size is? manual says 60mb but on gs forum i read 502mb or similar. do you think i need a scsi terminator aswell? any other issues to bear in mind? i am only starting out with this and could really appreciate the help. as a follow up – i got a cd drive working and loaded a few programs. the external hd drive i found is not working though. arrange options displays that the disk is empty and ready. Absolutely!! I did the same thing for about year tinkering around with useless crap. Millenium has been working great on XP with SCSI card inside. It’s a breeze to create multisampled instruments that I can save to MO disk and then later use that to create Akai S1000 CDs. I then throw them into either my Roland MV-8000 or S-760 and they import beautifully. I get much better results than using Chicken Systems Translator by the way. I’m still getting funky conversions out of that program. Does anyone know how to get a copy of recycle 2.0? I,ve got a cracked copy of 1.7 but it doesn’t work properly. Also how do you get 2 akai samplers on the same scsi chain? be a registered recycle user, contact propellerheads and purchase the 2.0 cd for $17, and wait a week or two for airmail. This is quite the conversation. I was lucky enough to receive an S2000 for free!!! I use to have an EPS 16 and I’ve had other samplers in the past. However, I never used an external drive via scsi. Right now I have a DYNATEK cd drive/hd. I think that’s what it is. I can’t find any info. on it and my S2000 does not recognize it. Does anyone have any suggestions? I have an old Mac G4 ( 10 euro!) with SCSI but it runs Mac OSX 10.5.8 so no Mesa. Maybe i’ll try to install OS9 on an old HD. Or try to get Millennium but i don’t have a PC with a SCSI card. I downloaded a couple of old Akai sample Cd-roms and burned them with Nero. Amazing sound quality. With sampled vintage analog synths the S2000 sweeps the floor with almost all of my synth modules! But it is indeed a tricky old beast that needs endless patience to tame. OTOH even with sampling IMHO hardware has more sonic punch than software . The wealth of information and advice above is both in-depth and mind-boggling. Was handed a S2000 a couple of months ago from a friend downsizing his collection (or, as he put it, off-loading doorstops taking up space). And only recently received the OS on floppy, so . . .haven’t had much time to play with it. On top of that, it is my first sampler. I have found numerous computer programs that purport an ability to link to and control the Akai S2000 and that, to do this, a link via the SCSI port to the PC must be made. But you make mention of transferring data via Zip or external drives in the main. And seen in other forums (though dated) they seem to be saying that SCSI/USB connections/adapters don’t really work. Is there now a way to connect the Akai S2000 to a PC via a USB adapter for manipulation and storage/retrieval purposes, or is it still necessary to manually transfer data collected on a PC to the S2000? As you might have guessed, not only am I new to this particular unit, I’m new to the artistry of sampling entirely. Great page, and bookmarked for future reference. I have removed the HD now as it kept blowing fuses, It’s not required not as I can read/write to/from the CF drive in the S3000XL and CDROM from the CD3000XL samplers. also a nice link of what I did ‘before’ the SCSI [and other] mods, quick and dirty but worked. Hi! This is some awesome modding you did, and I love the bluelights, they are awesome. I just bought an s2000 and am about to purchase a scsi card for pc, but i’m stumped by the whole cables thing. If I just want to get a 2940UW card to hook up the s2000 to my cpu, what cable exactly do I need? DB25 MALE to Centronics 50? I’m so confused. There are so many different names. I had thought I may end up buying all these different cables and none of them work 😦 I really love how this sampler sounds so crunchy. It’s a joy to read about your travels through vintage gear and.. well… Japan. Bookmarked your page and will come by often. Anyhow, I have experience programming old samplers and, in particular, the S2000. I have gone through all of the SCSI hurdles you could imagine. First, akaidisk is fine and all but I found the best way of transferring WAV to and from PC is by using the good old Mesa app. The trick is getting your scsi connections right. Errors are often the result of improper termination or conflicting ID’s. Once that is all set up right I found the most stable results through using XP (not win98). My most stable setup came with using an Adaptec 2906 scsi PCI card, and using the ASPI 4.7.2 drivers. I always make sure to turn on my scsi hardware before I turn on the computer. This setup was rock solid for me for years. There were a few quirks in Mesa, so I picked up Millenium but truthfully it had even worse bugs for me. So I would stick to Mesa. The ASPI drivers for S2000 SCSI setup are hosted here, and if you care you can check out my latest S1000 CD-ROMs I programmed on the S2000 using the setup mentioned. If you have any questions about this setup feel free to email me. I cannot find Mesa for Windows anywhere. Where can I purchase or download it? It’s not at Akai site anymore. Can anyone help me out, I would very much appreciate it. If its free perhaps someone could email me a copy or something. Maybe I could do a swap of some kind I don’t know I’d I have something you might want or need..
I’ve uploaded Akai Mesa 2.2 and the manual for you. I actually tried the ReoCities download a couple times and the archive said it was corrupt both times. I think that was literally the only location I found it at through a lot of searches. Seems the mailing list group is done as well..
Hi Jim, this is the best resource i have found so far relating to my particular questions, i have just purchased an S2K for silly money and want o use it with my mpc500 as a sound module playing patches but also for sampling loops and colouring the sound then back into the mpc, just to get away from the computer..
my questions relate to best way to get patches into the 2k? seems to be some online content by way of sample patches, can i just et a usb floppy and write them to that, do i need software to write akai format ?in a way the 2k will understand? better to scsi jazz drive and dump to that via laptop, still can i write in akai? trying not to have to fiind a g3 with os9 to use mesa but if i enjoy the process i might end up down that route..
Millennium is the BEST product I’ve used to get patches onto the S2000. I use it almost 100% now with the S2000. I can convert patches and then use Millennium to transfer over. This will require an SCSI connection. I believe it also only works on Win98 or XP. You basically need hardware SCSI connection and not USB. This works MUCH better than MESA. Everything is drag and drop, plus you can easily edit or create keygroups on the computer. I then use an MO drive to save the data to from the S2000. Later I can transfer the MO data to a CD-ROM and use a CD player to load back or the MO of course. OR you can convert samples to S1000 via Chicken Systems Translator and create a CD-ROM via Windows 7 for example. Then just load that CD-Rom into the S2000. This likely will require minor tweaking thereafter. Also note that Translator gets better with each update, but sometimes the translations don’t work 100%. Millennium requires work up front, but is perfect when loaded into the S2000 since you are working direct with SCSI. Translator requires work after you load into the S2000 to tweak the envelopes ( most often ) and sometimes the filters. Occasionally the keygroups are messed up if working with layered samples. At the end of the day, it’s all trial and error, but both solutions are the best I’ve found so far. I don’t bother with anything like zips or external hard drives anymore, just Millenium on xp and the scsi connection. getting an headache of just looking at all the problems people have with scsi etc..